The three largest countries by land mass are Russia, Canada, and China, respectively. They’re all among the top five largest oil producers in the world. Russia produces 10.9 million barrels per day, ranking third behind the United States and Saudi Arabia. But many smaller countries also benefit from high oil production. In fact, one tiny nation could end up changing the oil market forever. You won’t hear it mentioned in any conversations about oil exploration today. But it sits on more than 25 million barrels worth of oil reserves. And it’s smaller than the state of Vermont. 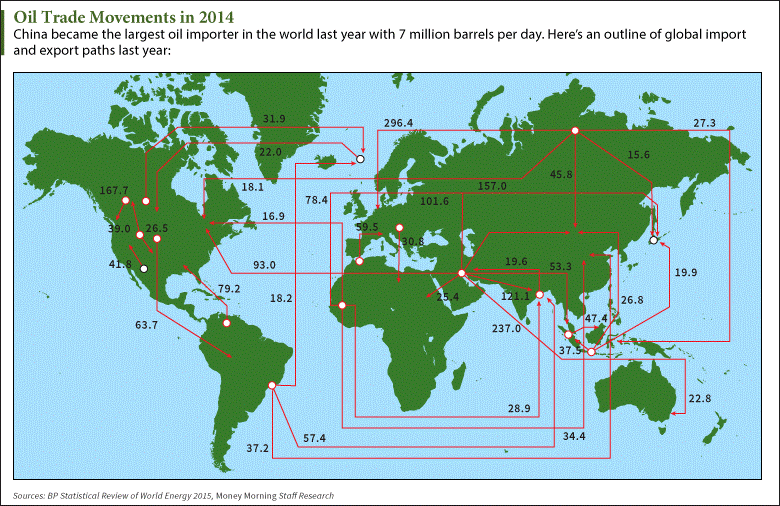 The worldwide oil market is a massive interconnected highway of imports and exports that grows larger each year. According to the BP Statistical Review of World Energy, global oil trade activity increased by 1%, or 490,000 barrels per day, in 2014. Exports have swung from West to East in recent years, with China becoming the world’s largest oil importer last year. Even at that rate, consumption still couldn’t outpace production. World oil production rose by 2.1 million barrels a day last year. All of the growth occurred in non-OPEC countries, with record U.S. and Canadian output increasing by 1.6 million and 310,000 barrels a day. But the biggest surprises in the oil market last year came from the smallest countries. These are the producers we never hear about in the news when we see oil supply surging and oil prices declining. Qatar is one of the smallest countries in Southwest Asia, dominating a modest 4,473 square miles of land area. According to the U.S. Energy Information Administration (EIA), it was the 14th highest-producing country in the world last year. Kuwait – the 77th smallest country in the world – produces 2.8 million barrels of oil per day. It also enjoys OPEC membership, alongside neighboring Iraq and Saudi Arabia. But now there’s a country the same size as one of the smallest U.S. states that could soon become a key terminal for imports and exports.